If you take any given link (or all outgoing links on the blue [or a triage of links as suggested in a modified “MoSCow” method here, starting with the places that always kill links quickly, like, if any still get posted, yahoo! ]), and paste it in the box HERE (wayback machine, Beta), and click “show latest”, it automatically has Archive.org take a snapshot, at that time, and then in a month or so, it will be permanently in the archive (which looks like this)… which can then be queried by any of many tools. So, basically, is there a way to get a computer to strip and copy links, paste them there, and then “press” a button on a web-page? Or is one of these tools more appropriate for this “archiving” task (Web Curator tool, Firefox Page-Saver/Scrapbook plugin). I should also clarify, the memento project is not for the “archiving” part, it is for the navigation, and interconnection of the disparate “archive-sources” — after they are captured; such as,http://www.webcitation.org/archive.php, http://www.archive-it.org/, http://webarchives.cdlib.org/p/projects, Backupurl, Heratrix open source crawling tool. Monitoring changes to web pages, an annotated list of detection tools from Rhodes-Blakeman Associates (2008). Update Scanner, a FireFox add-on monitoring tool. Preservation of Web Resources Handbook, (pdf) from the University of London Computing Centre, pp. 23-27 (2008). Tools, a section of Harvard University’s Web Archiving Resources pages (2008). Resource List of harvesting tools from the National Archives and Records Administration, USA (2005). HTTrack Website Copier, a harvesting tool that is easy to install and use. Copy an entire web site with HTTrack from ez-nets, home and small office networking support site (2005). Web Curator Tool, an easy to use, but not easy to install, comprehensive web harvesting toolset. might not have been crawled & archived yet. ])… which then parses the archives, and sees which, if any, possess the proper resources. Original Resource: An Original Resource is a resource that exists or used to exist, and for which access to one of its prior states is desired. Memento: A Memento for an Original Resource is a resource that encapsulates a prior state of the Original Resource. A Memento for an Original Resource as it existed at time Tj is a resource that encapsulates the state that the Original Resource had at time Tj. TimeGate: A TimeGate for an Original Resource is a resource that supports negotiation to allow selective, datetime-based, access to prior states of the Original Resource. The original poster might find this site interesting and on-topic, it is created by the Library of Congress Web Archives, it is the “minerva archive”, which has a whole lot of archives from immediately pre 9/11, and then also many from after… it essentially documents “how” America, and the world used the internet both during 9/11, and in the aftermath. And hereare is the list of other LCWA topics. Spanamwar.com; Action Reports and First Hand Accounts, Diver Charles Morgan, USS NEW YORK Describes his Descent into the MAINE (*graphic description of the results of war). Not sure what the “Battleship Maine” is? No excuses now. Via “single sites archive“. 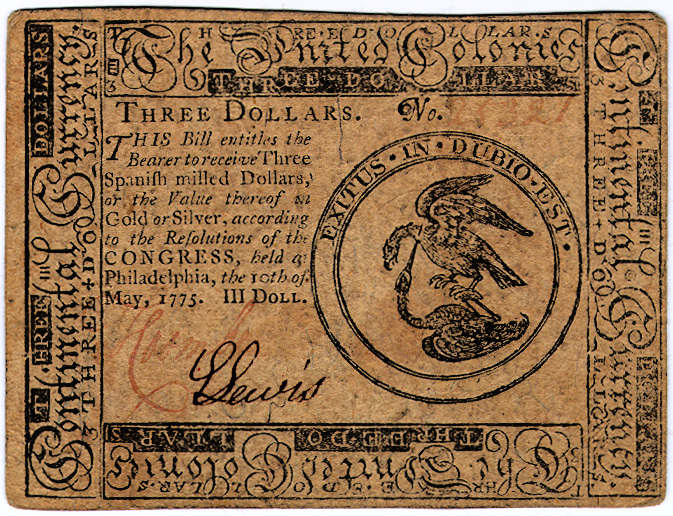 Gratuitous image of awesome three dollar bill; Continental Currency… seriously, are archives actually singularities, from over the event-horizon of which my time may never return?